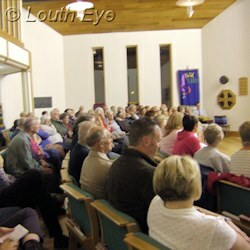 The Trinity Centre was packed on Wednesday 12th September for a meeting of concerned residents from Fulmar Drive and the surrounding area. They are worried about plans to build 149 homes on a nearby greenfield site. The executive summary: none of the residents want this. However planning officers are concerned that objections are made with a solid legal basis so that the council doesn't leave itself open to costly appeals. 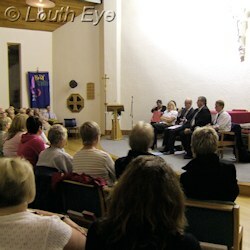 Councillor Sarah Dodds chaired the meeting, in which ELDC planning officers answered questions put to them. The developers, Taylor Wimpey, weren't invited and didn't attend. Andrew Wood of Kestrel Drive raised concerns about the environment. "Taylor Wimpey appear to have sidestepped the environmental impact issue," he said. "An environmental impact assessment is essential in this case. Bats fly about and we don't know where they roost and nor do Taylor Wimpey." Planning officer Paul Thompson explained some details of the assessments process, and the criteria for deciding which developments need a more thorough environmental impact assessment. "We determined that the impact wouldn't be more than local. It wouldn't be regional or national." One bone of contention was that these assessments are provided by the developers, and several people questioned their reliability, particularly the traffic reports. One resident pointed out that the new estate off Brackenborough Road isn't yet occupied, so the increase in traffic from that can't have been taken into account. Others voiced concerns about the width of the roads which would lead into the estate, where people often park second cars on the sides of the road. Beyond traffic and the environment, flooding is a major concern. One resident said, "This year that field was a complete lake. If this is built, does that lake go into my house?" "What we will do is design a system for a 1-in-100 year event plus climate change," one of the planning officers responded. However this was a concern for many, particularly considering how the planning system appeared to have failed the residents of Riverhead who were left homeless earlier this year as a result of surface water flooding. Mark Roberts, the Deputy head of Cordeaux, spoke of his worries about the junction between Keddington and Brackenborough, where the Spar shop is. "We've had a number of very close misses. Two students have nearly been hit." "I've had several near-misses in my driveway trying to get out, it's a nightmare," said a woman who lives on Brackenborough road. Another man said "the 250 cars shouldn't be there in the first place. Roundabouts aren't going to manage the cars." I don't know where he got the figure of 250 cars from: the number planners have to account for is much higher when it comes to a development of 149 households. I've heard figures of 4 to 7 cars per household, but it's all guesswork when it comes to future car ownership and traffic levels. It was a long meeting, but I didn't hear a single resident speak out in favour of the development, whilst people heartily applauded points against it and calls for independent assessments. However Paul Thompson talked about the difficulty of rejecting an application without good reason. "We have to have conclusive evidence," he said. "Otherwise we risk an application of costs against the authority for unreasonable grounds for refusal." He went on to explain why some types of objection aren't taken into account. 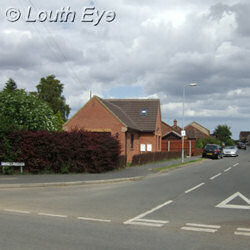 "East Lindsey don't have an adequate supply of housing. We can't resist development on the grounds that we already have an adequate supply." Andrew Wood said "in Louth we have 404 people on JSA. We're going to bring more people into a town where there aren't any jobs." But again this isn't something the planners can take into account. "We can't stop developments based on commercial reasons," Paul Thompson explained. So if existing developments aren't selling it doesn't affect the outcome. 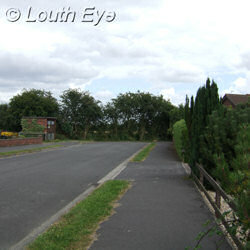 Louth is set for a flood of new development applications of this kind. Thanks to the risk of flooding on the coast, especially around Boston, Skegness and Mablethorpe, it is seen as more suitable than other parts of East Lindsey for building houses. And with that shortfall in supply that Mr Thompson mentioned, Louth is set to be the battleground for more large-scale planning applications of this kind. Kestrel Drive resident Simon Tighe is spearheading the campaign against the development, and he has launched a petition against it.